Suedstrand 40, D - 26382 Wilhelmshaven, Germany. Krijgslaan 281 - S8, B 9000, Gent, Belgium. 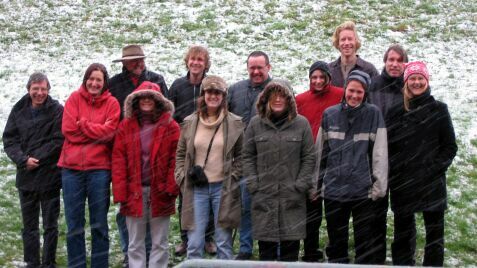 "The happy gang enjoying glorious weather at the February 2004 MAFCONS project meeting, Wilhelmshaven." Back row: Simon Greenstreet, Steven Degraer, Mike Robertson, Annelies Goffin, Henning Reiss (extreme back row), Johan Craeymeersch. Front row: John Lancaster, Ruth Callaway, Lis Lindal Jørgensen, Leonie Robinson, Helen Fraser, Ingeborg deBoois, Ingrid Kröncke.